FLASH, the Free-Electron LASer in Hamburg, started user operation in summer 2005 as the first free-electron laser for XUV and soft X-ray radiation. It is operated in the "self-amplified spontaneous emission" (SASE) mode and currently covers a wavelength range from 4.2 nm to about 52 nm in the first harmonic with GW peak power and pulse durations between 30 fs and 200 fs. FLASH1 offers five beamlines for users in the FLASH experimental hall 'Albert Einstein' (PG and BL beamlines). In the past years, an additional FEL undulator line in a separate tunnel - FLASH2- and the new FLASH experimental hall 'Kai Siegbahn' have been built adjacent to the existing FLASH facility now called FLASH1. First lasing of FLASH2 was achieved in August 2014 in parallel to FLASH1. 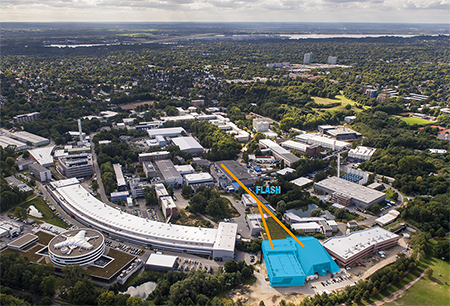 Now the FLASH facility at DESY comprises two separate and almost independent FEL sources. This upgrade enhances significantly the capacities for XUV and soft X-ray FEL users at DESY. FLASH2 will offer up to six experimental stations in the FLASH experimental hall 'Kai Siegbahn', in building 28k. Since spring 2016, the beamlines FL 24 and FL 26 are available for users. At FL 26 the permanent end station REMI, a reaction microscope from the MPIK Heidelberg, is set up.